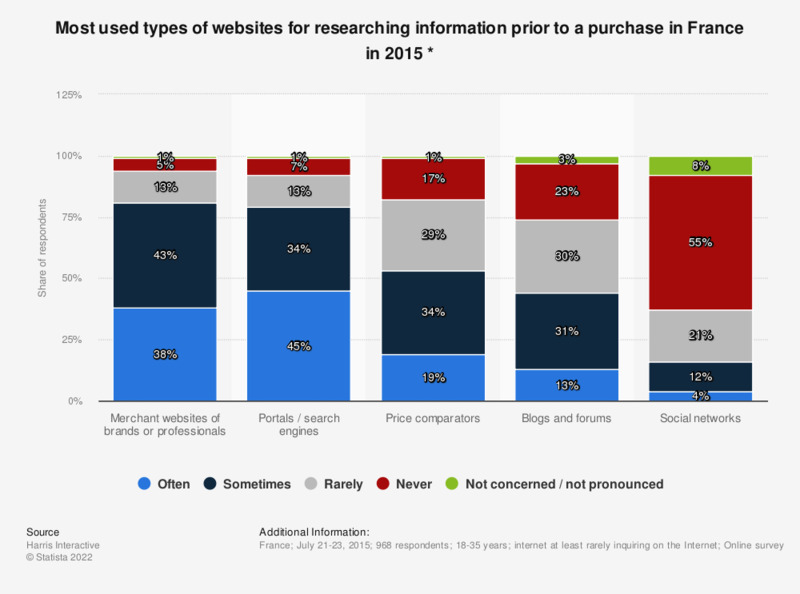 This statistic represents the types of websites that were used the most to obtain information before a purchase in France in 2015. Nearly 40% of the respondents said that they had often resorted to commercial websites of brands or professionals. * The question was formulated by the source as follows: "And consult you, to inquire before a purchase ..."
How many different websites would you say you visit in a typical week? When you research information on the internet prior to a purchase, would you say that the following elements have much, little, or no influence on your final choice? In general, do you ever research information online before making a purchase online or in-store? Do you agree that selling drugs online on foreign websites is unfair competition for French pharmacists?